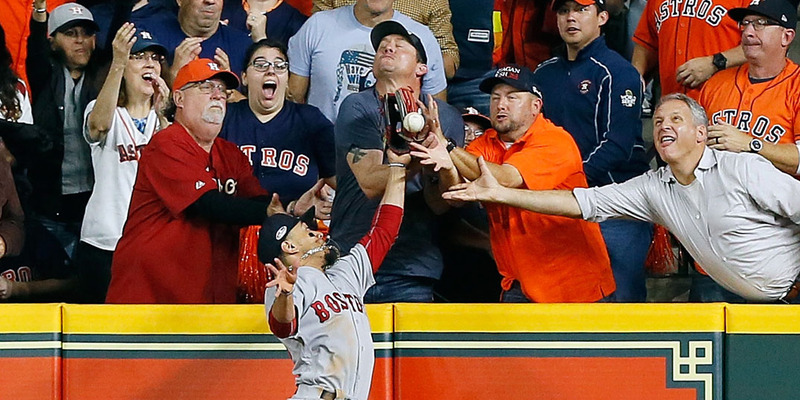 Bob Levey/Getty ImagesMinute Maid park has a camera that captures the portion of the right field wall where Red Sox center fielder Betts leapt up for the play, but a hilarious photo reveals why umpires didn’t get a clear view. In the first inning of the Boston Red Sox – Houston Astros ALCS Game 4 matchup, Boston center fielder and AL MVP favourite Mookie Betts attempted to rob Houston’s Jose Altuve of a home run to the right-field wall. Although Betts didn’t come away with the catch, umpire Joe West called Altuve out due to fan interference. A Minute Maid Park security guard’s interest in the play may have led to the call being upheld. With the Houston Astros trailing 2-0 in the first inning of their Game 4 ALCS matchup with the Boston Red Sox, Astros designated hitter and last season’s AL MVP launched a shot into the right-field stands to tie the game. Red Sox center fielder Mookie Betts leaped above the wall and reached with his glove in an attempt to rob Altuve of the home run. Upon review, it appeared as though Betts had a shot to come away with the catch if not for a fan’s outstretched hand. Much to the dismay of fans in Houston, umpire Joe West called Altuve out due to fan interference. Had the security guard leaned back, umpires may have been able to determine whether or not the fan – since identified as Troy Caldwell – officially interfered with the play. There’s little doubt that Caldwell’s hand forced Betts’ glove to close before he could snag the ball, but whether the contact occurred in front of the wall or behind it is still up for debate.